Pick up some Goat Milk Soap to go with your Cotton Cloths and Face Scrubbies. Mix or match colors and soap fragrances to make your own unique gift baskets that friends and family will love. White cloths are always available, however the availability of other colors will vary from time to time. Please contact us to ask about our current color choices. If you have no color preference, you will receive the color of our choice based on currently available stock. If you are looking for specific colors, we will do our best to accommodate your request. 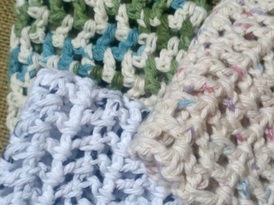 Upon request, we can offer cotton cloths and face scrubbies in the same colors for a matched set. Made from the same, 100% cotton yarn as our cotton cloths, these handy face scrubbies fit in the palm of your hand. They are soft to the touch, and the texture of the yarn provides just enough scrubbing power to help remove dirt, oil, and make-up when you wash your face, without harsh abrasives. The knots in the yarn provide a gentle facial massage as you scrub clean. Our face scrubbies come in assorted colors. If you have a specific color preference, we will do our best to accommodate your request. 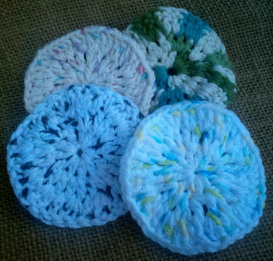 Upon request, we can offer face scrubbies and cotton cloths in the same colors for a matched set.